Experience a true mountain log cabin at Mountain Joy, a cozy cabin in a peaceful woodland setting. Built on a hillside, this spacious one-bedroom cabin in Gatlinburg will make you feel like you in a luxurious treehouse, with plenty of peace and quiet to enjoy the sounds of nature. Despite feeling miles away, it is only a short drive to Parkway in Pigeon Forge and shopping, dining, and entertainment. Immediately upon entering, the entire left side of the cabin is completely open, with high ceilings and a window the entire width of the house. Underneath it is an attractive fireplace made of river stones, with a wide hearth that might just have you perching to warm your hands, no matter the season. Facing it is a comfortable leather couch, with an easy chair in the far corner, surrounded by floor-to-ceiling windows. The master suite has its own bathroom with a unique jacuzzi room. 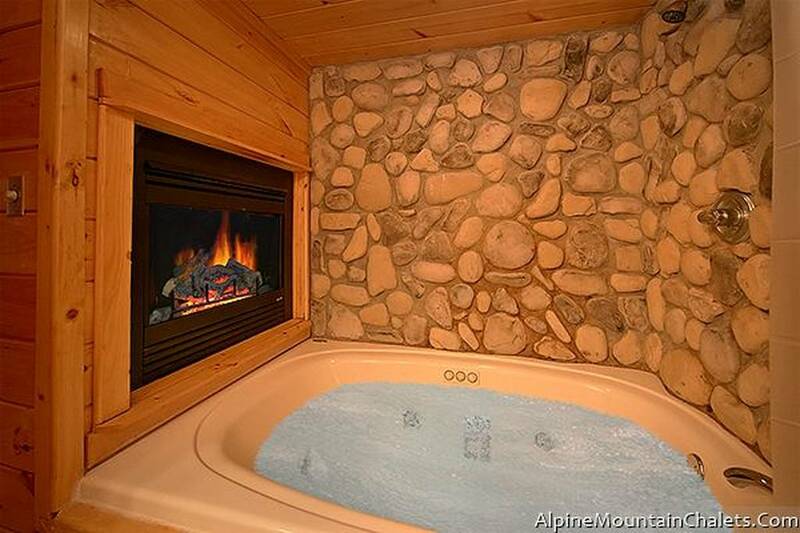 In additional to the whirlpool tub, the room is set beneath river stones, with a gas fireplace to the side. None of our other cabins in the Smokies can offer this pleasant combination. The suite also features a queen-sized bed and, if you are bringing children, there is a day bed in the loft, with a twin, pullout trundle, which also has a pool table and television. This secluded cabin has a charming covered porch, with rocking chairs, picnic table, and hot tub. There is also a charcoal grill to compliment the full kitchen. Mountain Joy is reached by an amazing walkway that may make you feel like you have left the world behind. Yet, it is only two miles to the Gatlinburg Arts and Crafts Community and four miles from the Parkway in Pigeon Forge, bringing amusement parks, shopping, and the gateway to the Smoky Mountains within easy driving distance.